The Digital Research Library of Illinois History Journal™: August 24, 1893; ILLINOIS DAY at the 1893 World's Columbian Exposition. 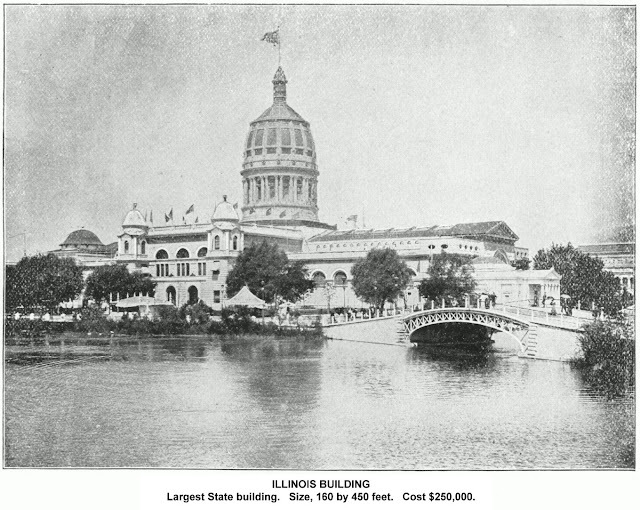 August 24, 1893; ILLINOIS DAY at the 1893 World's Columbian Exposition. Illinois day at the World's fair was the day when the people of the proud Prairie State gathered in the grounds of the White City to do honor to the land of their birth and their adoption, and the estimate put on the number of patriotic folk who will be there - a figure set by Horace Tucker, the Department of Admissions Superintendent, - is 350,000, and they will come from every part of the State, from up by the dividing line between Illinois and Wisconsin, from down in lower Egypt, and from the counties that border on Indiana and those washed by the Mississippi. The people who are numbered among the visitor to the Fair on this day will find arranged for their entertainment many things of interest, and there will not be a single speech to try their patience during the whole day. There will be music, parades, receptions, reviews and fireworks. 8 pm to 10 pm - Parade of the 5,000 State Soldiers of the Illinois National Guard. 8:30am - Guard Mount, West Point Cadets, in the Government Plaza. 9 am - Exhibition of Clydesdales and Herefords at Live-Stock Pavilion. 9 am to 12 pm - Pullman Military Band will Furnish Music from the Bandstand South of the Illinois State Building. 10 am - Parade of Illinois Troops over Entire Grounds. 11 am - Orchestral Concert at Festival Hall. 11 am - Congress of Rough Riders of the World Grand Parade. 12 pm - Review of Illinois Troops at Illinois Building. 1 pm - Organ Recital by Clarence Eddy at Festival Hall. 2 pm - Governor's Reception to the Public at Illinois Building. 2:30 pm to 5 pm - Pullman Military Band will Furnish Music from the Bandstand South of the Illinois State Building. 2pm to 4pm - Exhibition Drill by Company 'C' of the Third Infantry and the Springfield Cadets at the Illinois Building. 4 pm - Presentation of Medals for Heroism to Marshall Murphy, Lieutenants Barker and Miller, at Women's Building. 4 pm - Review of West Point Cadets by Gen. Miles in Front of Terminal Station. 5 pm - Performance at Prof. Albert's Natatorium on the Midway Plaisance. 5:30 pm - Prof. Bredberg Will Play the 'Chime of Bells' in the Tower of Machinery Hall. 6 pm - Dress Parade, West Point Cadets, Government Plasa. 8 pm - Grand Special Fireworks Display on Lake Front. 8 pm - Concert by Exposition Orchestra in Festival Hall. 8 pm to 10:30 pm - Electric Fountain Display and Grand Court Illumination. 8:30 pm - Reception to Citizens of Illinois at Their State Building. The day's entertainment is to begin with the march of the people from Midway Plaisance. The State militia will march into Midway from Cottage Grove Avenue at 9 o'clock this morning and move down the street in company front order. As they pass by the natives of each village, beginning with the Bedouins, will full in behind on their camels and donkeys and Arabian horses. The Bedouins will be followed by the Laplanders, then will come in the order Dahomans, the Chinese, the American Indians, the Hawaiians, the Persians, the Egyptians with their camels and donkeys from Cairo street, Old Vienna, the St. Peters band and guard, the Moorish Palace band, the Turks, the German Village band, the Swiss singers and horn blowers, Hagenbeck's performers, the Johore natives, the Samoans, the Algerian singers, the beauty show, and the Irish Villagers. But there will be no parading through the grounds. So far as the Plaisance crowd is concerned it will simply march down to the Illinois Building and then march back again. The concessionaires would not agree to lose two or three hours' business in the middle or the day and make a tour of Jackson Park. Promptly at 11 o'clock there will be a grand parade of the "Congress of Rough Riders of the World" shown in Buffalo Bill's "Wild West." Arabs, Indians, cowboys, and Mexicans will ride in the procession, which will be headed by the "Cowboy Band." The parade of the 5,000 State soldiers comprising the Illinois National Guard will pass the Illinois State Building at 12 o'clock. Gov. John P. Altgeld has promised to take the place to which he is entitled by virtue of his office as Commander-in-Chief. He is to ride at the head of the troops surrounded by his staff until he reaches the Illinois Building, where he will review the soldiers from a point just opposite the southwest corner of the building. The parade will enter the grounds between 8 and 10 o'clock at the southeast corner. It will pass the Anthropological Building, thence past the windmills to the east front of Machinery Hall, across the east plaza of Administration Building, then north between the Electricity and Mining buildings, across the bridge, north and west past the Manufactures Building to the lake front, thence north to the Art Gallery, and west and south to the Illinois State Building. The festivities will begin early with the military department and continue until late in the afternoon. After the review there will be an exhibition drill by Company C of the Third Infantry and the Springfield Cadets at the Illinois Building between 2 and 4 o'clock. At 2 o'clock this afternoon an informal reception to the Governor and staff will be held in the Illinois Building, to which all citizens of Illinois and other States and countries are invited. There will be a fine display of fireworks tonight from the lake east of Manufactures Building, the electric fountains will be running, the search lights going, Wooded Island will be illuminated, and gayly lighted craft will float about the waters of the lagoons. In the fireworks display in addition to the numerous novel effects furnished there will be two special set pieces, one showing the facade of the Illinois State Building, 60 by 40 feet in size, containing 12,000 separate burning pieces, and the Lincoln Monument at Springfield, 40 by 40 feet, with 10,000 burning lances. "Old Glory" and the American eagle will burn in the Eastern sky. The Pullman Military Band will furnish music from the band stand south of the Illinois State building from 9:30 am to 12pm and from 2:30 to 5 pm. Prof. Bredberg will play on the chime of bells in the tower of Machinery Hall at 5:30 o'clock in the afternoon, beginning with "My Prairie Land. My Illinois," and; running through fourteen selections. Research by Neil Gale, Ph.D.